505J6 Poly-V Belt. BANDO INDUSTRIAL GRADE. 50.5� Length. 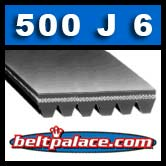 6-Rib PJ1283/505J belt replaces fitness belts, compressor belts, drive belts, and many other electric motor belts. 505J-6 Micro-V Belt.